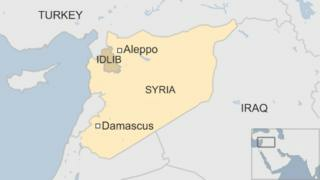 At least 35 Syrian soldiers have been killed in a cargo plane crash in north-western Idlib province, officials say. State media said the crash was due to "weather conditions and heavy fog" as the plane was attempting to land at Abu al-Duhur military airport on Saturday. But al-Nusra rebels, linked to al-Qaeda, said they had shot it down. Militants have shot down several government planes in the past. In December, Islamic State (IS) militants captured a Jordanian pilot in Syria. The year 2014 was the deadliest year yet in Syria's four-year conflict, with over 76,000 killed, activists say. The air forces of Jordan, the US, UAE, Saudi Arabia, and Bahrain have carried out hundreds of air strikes on IS in Syria in the past few months to "degrade and destroy" the IS.